Uber Doctor? 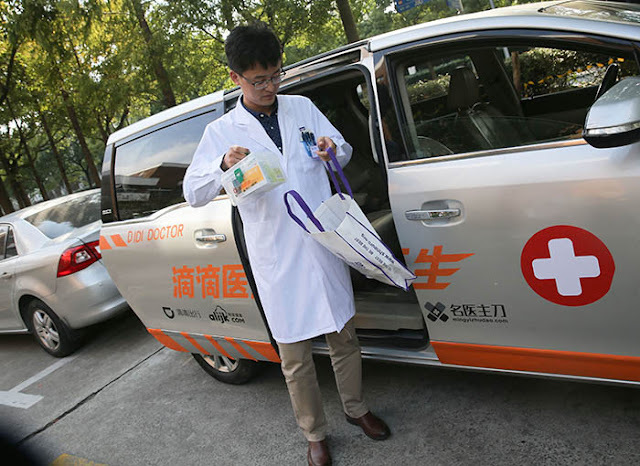 China's version of the taxi app just launched a home doctor visit service. The company that runs China's answer to the Uber app - DiDi, has just launched a home doctor service, called DiDi Doctor. A pilot program of the doctor-hailing app is being run out in four cities: Beijing, Shanghai, Hangzhou, Nanjing. The services promotes itself as offering a renowned surgeon for private consultations. In its first few days it got 20,000 calls - but only treated 40 patients. The service is being run in cooperation with Ali Health, and is currently being offered for free - for those who can get through. However, feedback on the service has been mixed, with consumers doubting the experience of the doctors involved, and questioning whether they are even entitled to treat patients outside of hospital. A pregnant woman called Chen who used the service in Shanghai, said she thought it would offer a way to avoid the long waits at the tertiary hospital. However she found that the doctor dispatched was a cardiologist with no experience in obstetrics and gynaecology. The doctor also told her that he was only allowed to give general advice and could not write prescriptions for pharmaceuticals - only minor medications and supplements. It seems the DiDi Doctor staff are on secondment from private hospitals, but they do not have authority to practice medicine beyond their registered place of work. Users also questioned the calibre of he doctors involved, saying that good doctors were already in high demand, seeing 30+ patients in a morning - why would they spend a day driving round seeing only four or five patients. Users also questioned the business model, saying they would pay about 200-300 yuan to see a doctor in a public hospital - how much will DiDi Doctor charge when the service is beyond the test stage?